Feeta is the latest Instagram handle that’s got us gushing. 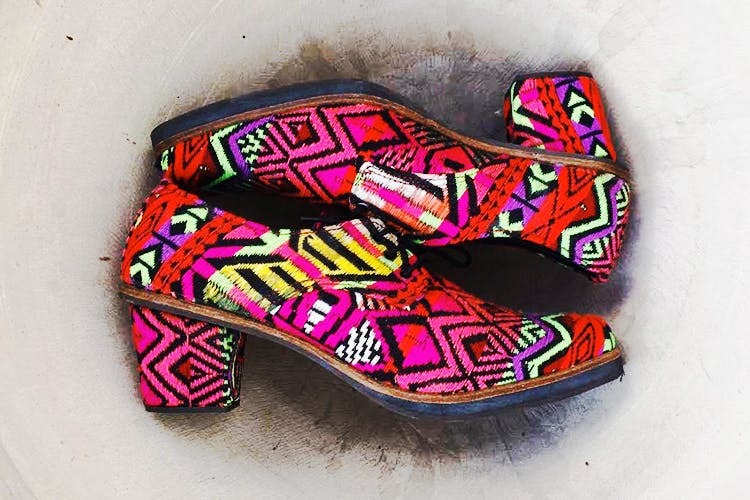 Amrita, the designer behind all the handwoven fabric shoes, is killing it with these made-to-order eye candies that come in exact sizes (even a 6.5 is acceptable). You’ll find brogues, Oxfords, block heels and boots for both men and women in many fascinating designs—from standard browns to boho, multicoloured ones. A self-confessed shoe hoarder, Amrita had been working as a stylist when she realised how much she loved sourcing. She walked into stores and swathes of indie fabrics called out to her till she unwittingly walked out with her hands full. It was then only a matter of time before it struck her that she could do something magical with her love for shoes, fabrics and designing in general. Her Kimkhab oxfords, for instance, were created because she had vintage silk cloth piece sitting in her wardrobe for a long time. This is the simple story behind a rather cool brand. She also admits to using upholstery fabric sometimes for the colourful pairs that look straight out of a gypsy dream. And the best part: They’re all customised, so the size fits like a glove and you get something that’s perfectly in line with your aesthetic sensibilities. The prices start at INR 2,000, which is not bad at all for such unique shoes. We wish there was a walk-in store as well, for those of us who those are wary of online shopping.